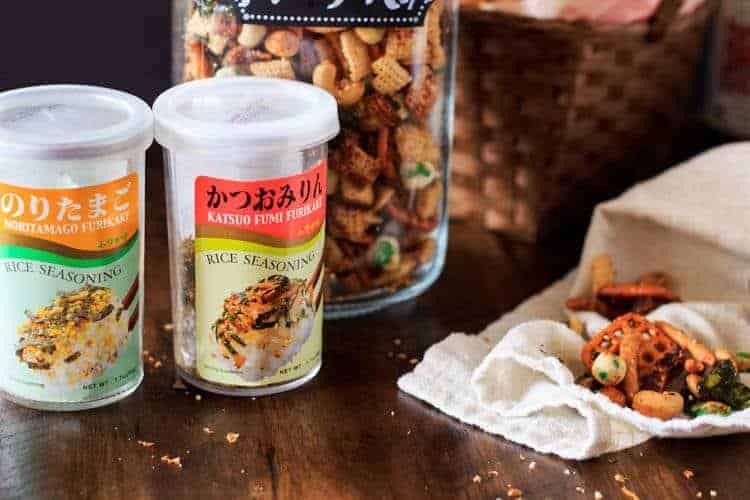 Wasabi peas, sesame sticks, roasted cashews and honey roasted peanuts tossed with a sesame, ginger, and tamari sauce and sprinkled with furikake… Deliciously Different Asian Party Mix delivers umami, salty, savory, spicy, and a hint of sweet in one delicious handful! My focus with Beyond Mere Sustenance has (until recently) been primarily on healthy main dishes and sides. Lately, though, I have included cocktails – Donner and Blitzen, Apple Pear and Sage Martini, Farm Fresh Cocktails to Pair With Food, and An Exotic Tropical Margarita – and an appetizer or two – Goat Cheese and Chorizo Stuffed Piquillo Peppers, Caribbean Shrimp Tapas, and Ancho and Chocolate BBQ Sauce and Mexican Meatloaf. That list would certainly impress a Super Bowl Party attendee! 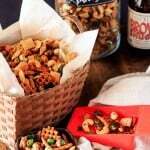 However, I think most hosts are looking for something a little closer to beer and Chex party mix. Am I right? I love Asian flavors, and my well-stocked pantry will confirm that fact! Tamari (similar to soy sauce but a byproduct of miso), mirin, sriracha, ginger, garlic, sesame oil, and furikake are items I keep stocked. ALWAYS. In fact, as I’m cooking, if I notice one of these items is low, my hubby enters it into OurGroceries immediately. He’s well-trained. 😆 Actually, he loves to eat, so he’s a great support! 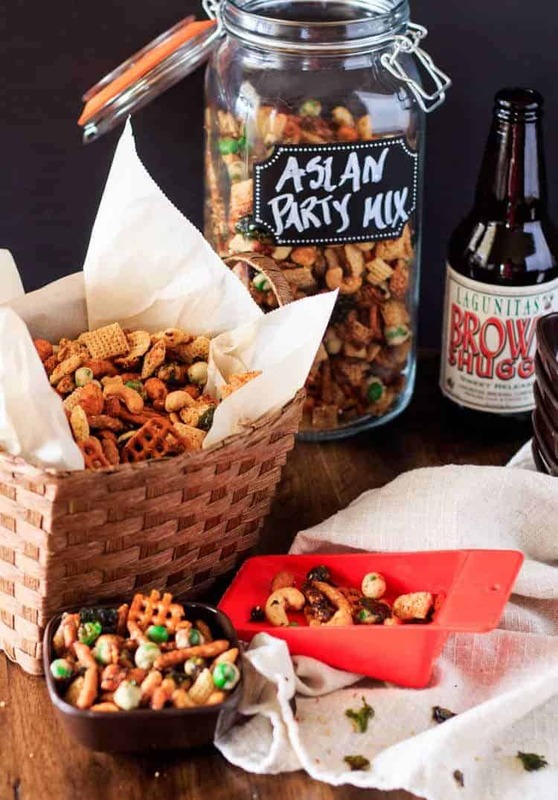 So, what does that have to do with Deliciously Different Asian Party Mix? When I began working on this recipe, I went shopping for the major components – sesame sticks, wasabi peas, rice Chex, cashews, honey roasted nuts, seaweed, pretzels – knowing I had the ingredients for my Asian-inspired sauce at home. 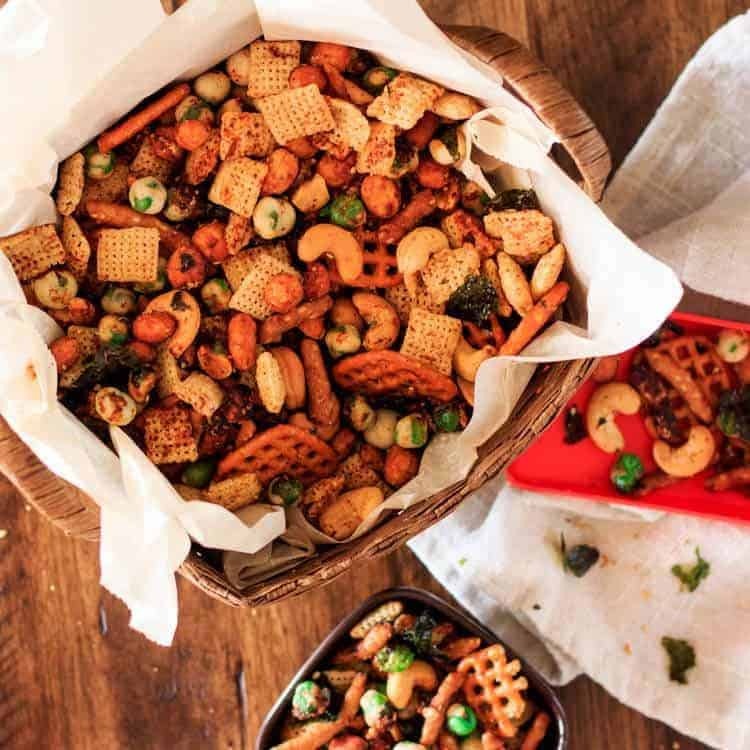 Wasabi peas, sesame sticks, roasted cashews and honey roasted peanuts tossed with a sesame, ginger, and tamari sauce and sprinkled with furikake... Deliciously Different Asian Party Mix delivers umami, salty, savory, spicy, and a hint of sweet in one delicious handful! Preheat oven to 250 degrees (225 convection). Make the sauce by combining all sauce ingredients, and heating in the microwave about 1 minute. In a very large mixing bowl, combine all the dry ingredients. Toss gently. Pour the sauce mixture over slowly as you toss it together. Scrape the mixture onto two 13 x 9 baking pans coated with non-stick spray. Scrape any sauce remaining in the bowl over top. Sprinkle with furikake (about a tablespoon per pan) and seaweed (if using). Cook until the mixture is completely dry and toasted. Cool completely before storing in an airtight container. Calories are an estimate based on MyFitnessPal and my specific ingredients. Yours will vary. Mirin is a Japanese rice wine with some sweetness and acidity. Click here for substitution instructions. We buy seaweed snacks in a small cellophane tray at our local Asian market. They're super thin and easy to crumble over top. The amount crumbles down to a couple of tablespoons at most. I add furikake each time I stir the mixture. I am not super heavy-handed with it like many furikake party mix recipes tend to be. I use about 1/2 the jar on the two pans. Cooking time varies widely according to humidity, your appliance, the exact amount of liquid to dry ratio, etc. It is important to cook until the mixture is completely dry, stirring regularly to keep it from burning. I suggest pans with sides (like a cake pan) rather than a baking sheet. With all the stirring, you will lose some pieces over the side of the pan if you use a baking sheet! Trust me, I did it! « 21 Healthy Dinners In 45 Minutes Or Less!